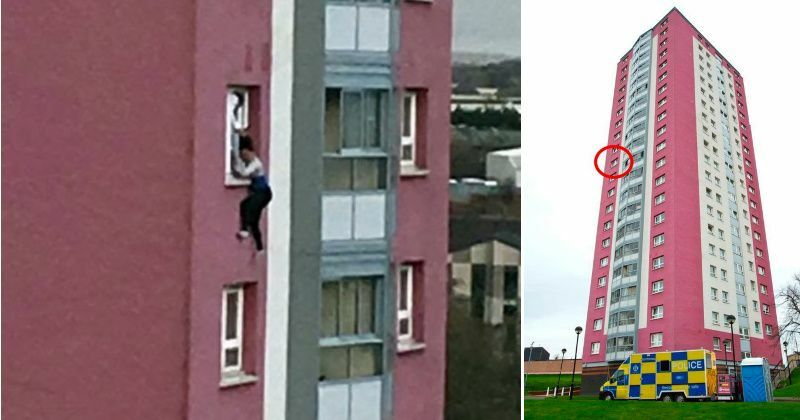 An Eritrean woman plunged to her death after being dangled by her hair from an 11th story window of high-rise building in Glasgow, Scotland, according to local media. Alem Shimemi, 30, fell roughly 100 feet after witnesses reportedly heard her screaming and attempting to climb back in the window while someone inside held her hair, the Daily Record reports. Bystanders apprehended an “African” man who was “chanting” and “praying,” according to a witness. Women at the scene helped hold down a man trying to run away. He was “chanting”, “praying” & “looked out of the window”, eyewitnesses said. The same witness assisted others in tackling a man who had fled the building and subduing him until police arrived. He reportedly spoke a foreign language, which was understood by other women on the scene. The Daily Record indicates that ‘many immigrants’ are housed in the tower blocks. Police are treating Shimemi’s death as “suspicious” but have yet to make any arrests. Paul Joseph Watson breaks down the story surrounding a woman who left the U.K. when she was 15 to marry a member of ISIS and join their Islamic caliphate revolution. Now, after giving birth and naming her son after a Muslim warlord, she would like to return to the U.K. to cash in on the benefits of Western civilization. At least nine Indian troops and Kashmir militants died during a shootout on Monday, as tensions escalated following a suicide bombing attack that killed more than 40 Indian paramilitaries last week. The fighting went on for several hours in the Pulwama district, south of India-administered Kashmir’s main city of Srinaga, where Indian soldiers were searching for militants tied to the Pakistan-based Islamist group Jaish-e-Mohammad (JeM), which claimed last week’s attack. Four soldiers, a policeman, three militants and a civilian were killed in the latest clash, officials said. An army major was among the dead, along with three militants from the JeM group. Security force sources told Reuters news agency that the suspected organizer of the suicide bombing in the disputed region of Kashmir was also killed, echoing reports from local broadcaster NDTV. Dan Lyman joins Alex Jones to give a small taste of the massive, Islamic invasion happening across Europe. Pakistan has warned India against linking it to the attack without an investigation, saying that it was part of New Delhi’s “known rhetoric and tactics” to divert global attention from human rights violations in Kashmir. Indian Prime Minister Narendra Modi on Monday rejected the possibility of talks with Pakistan following the deadly bombing. Meanwhile, Saudi Arabia said it would try to “de-escalate” rising tensions between Pakistan and India during a high-profile summit in Islamabad. “Our objective is to try to de-escalate tensions between the two countries, neighboring countries, and to see if there is a path forward to resolving those differences peacefully,” said Saudi Foreign Minister Adel al-Jubeir. India and Pakistan both administer parts of the border region of Kashmir, with both laying claim to more of the disputed territory. It’s one of the main disputes between the uneasy nuclear neighbors. Owen Shroyer delivers commentary on the rise of “Trump Derangement Syndrome” in America.